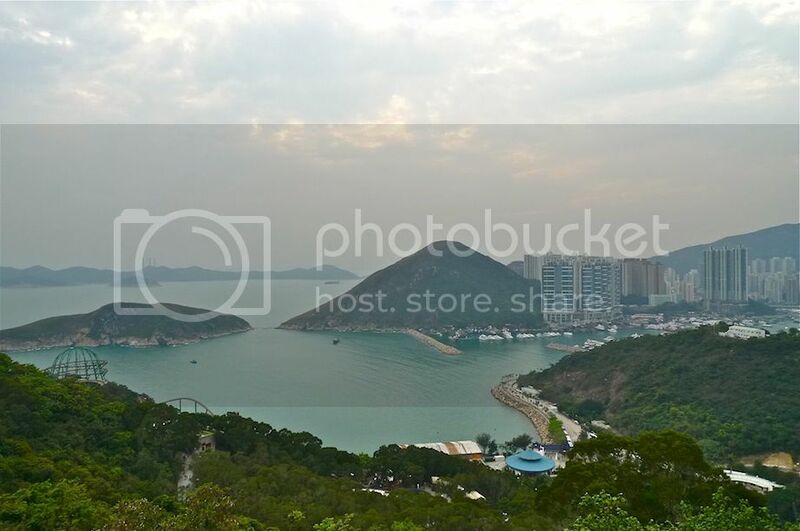 Having spent half a day at The Waterfront in Ocean Park Hong Kong, my friend and I took the cable car up to the The Summit. This is the view I saw after we walked out of the cable car station. 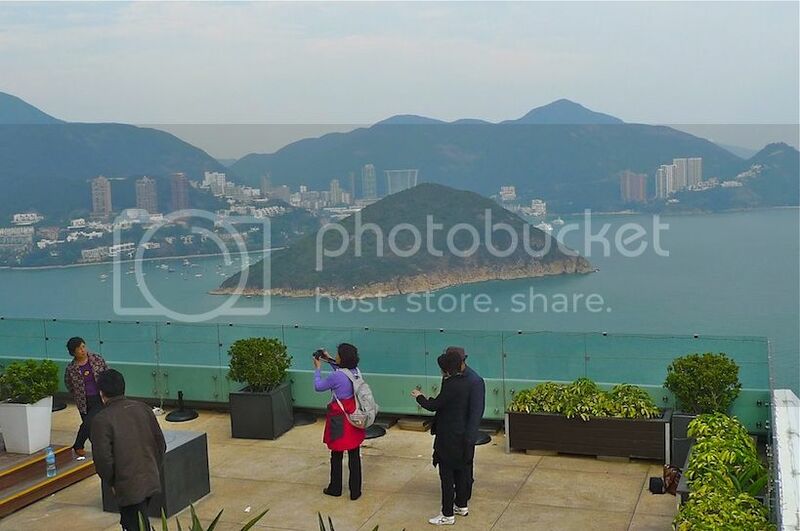 I have to say the weather in Hong Kong during March was really pleasant! The only downside is that photos taken during this rather misty weather don't turn out that well. 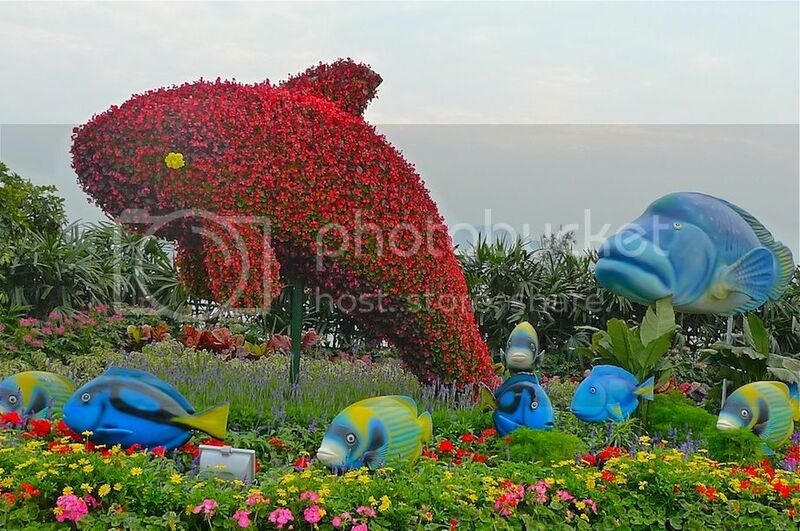 We came across a beautiful mini garden complete with fishes and a dolphin! 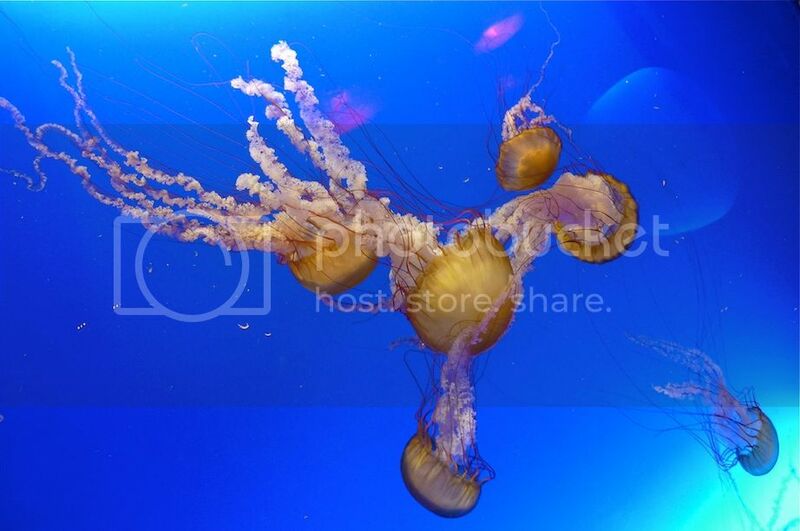 Don't you think this picture below almost looks like scene from under the sea? 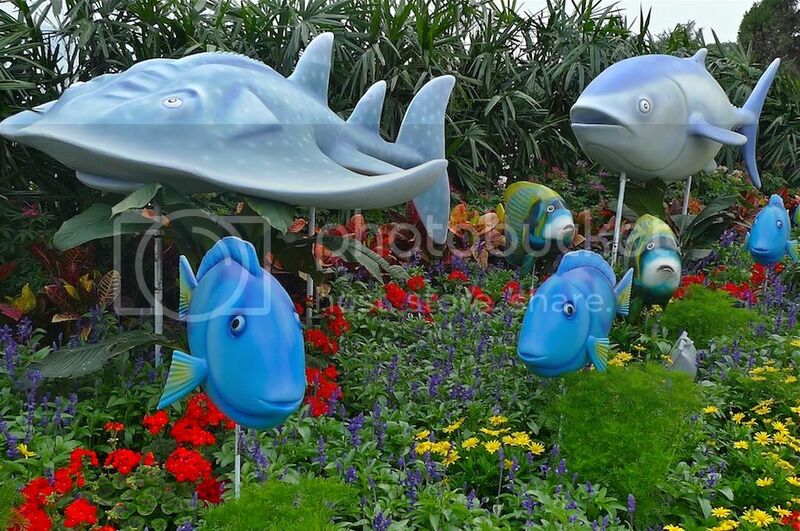 I wonder what is this blue fish with the giant bump on its head called? 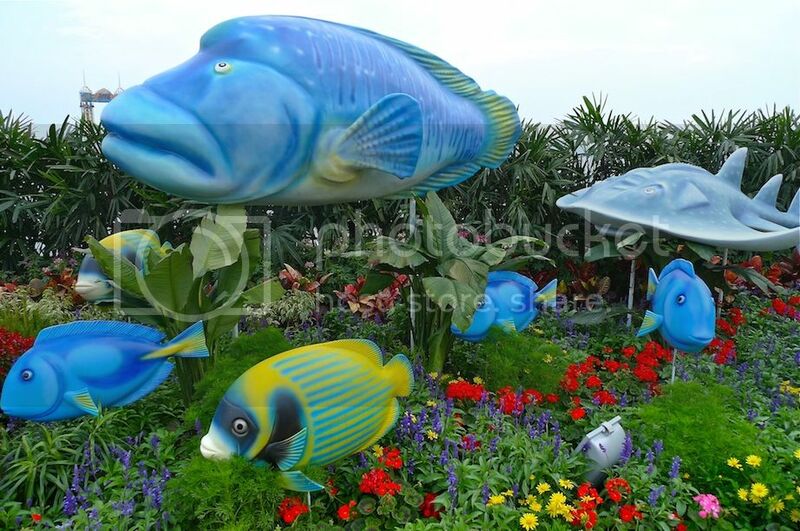 Reminds me of the flowerhorn fish! 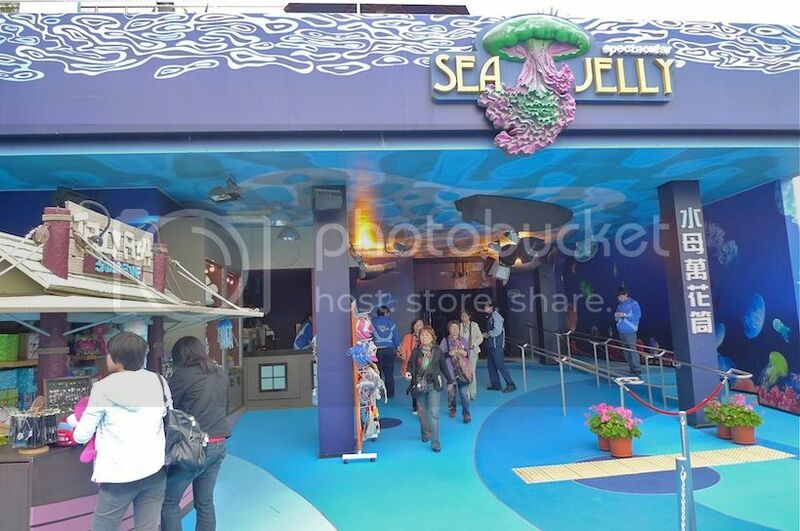 The first place we wanted to visit was the Sea Jelly Spectacular. 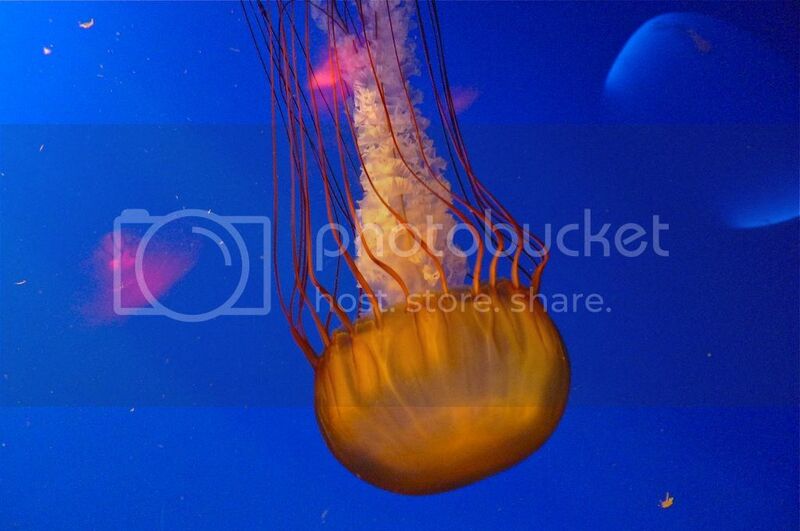 Along the way to the Sea Jelly Spectacular, I saw The Abyss and The Eagle rides far away in the distance. The Abyss (left) is a 20-floor vertical free fall ride and the Eagle (right) is a gravity-defying spinning ride, both of which I did not have the guts to try. I snapped a picture of this ship. Is it a cargo ship? I almost wanted to take a ride on the Ocean Park Tower. 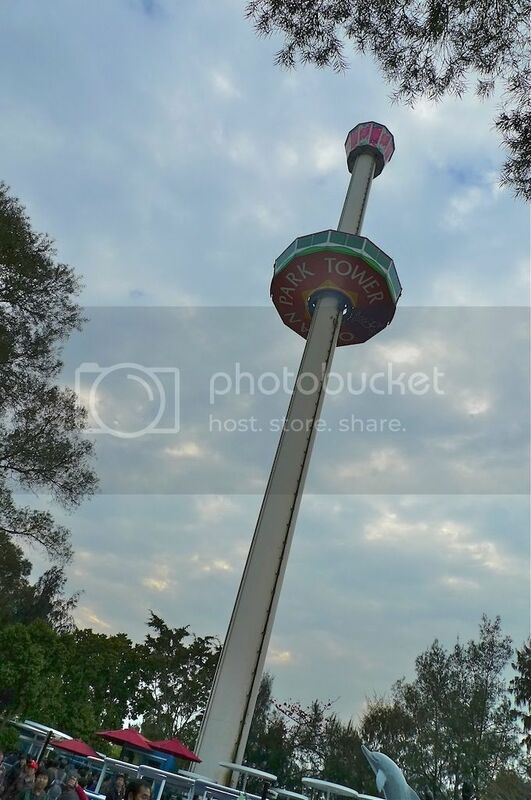 This soaring rotating tower is not unlike Malaysia's very own Menara Taming Sari in Melaka or Singapore's Tiger Sky Tower. 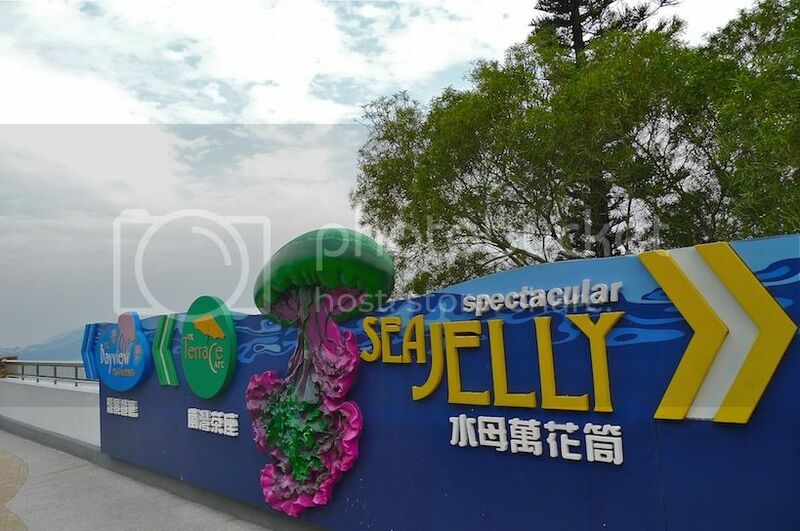 Soon, we reached the entrance to the Sea Jelly Spectacular. 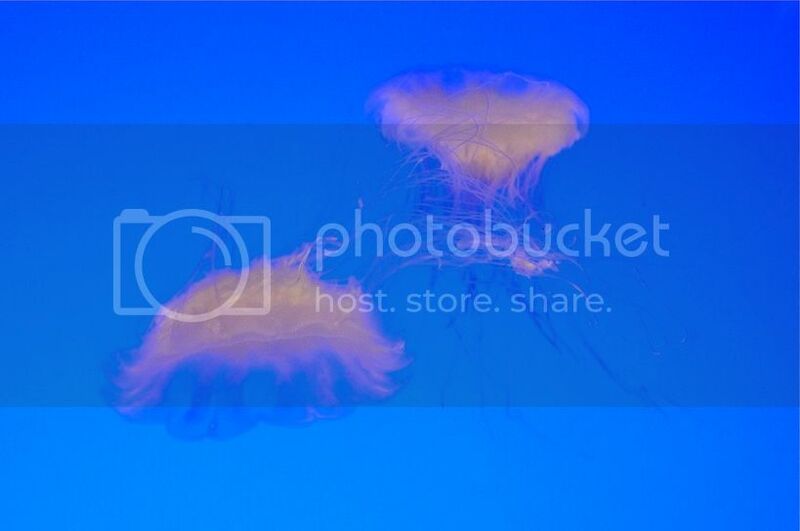 I was quite impressed with the sea jellies! 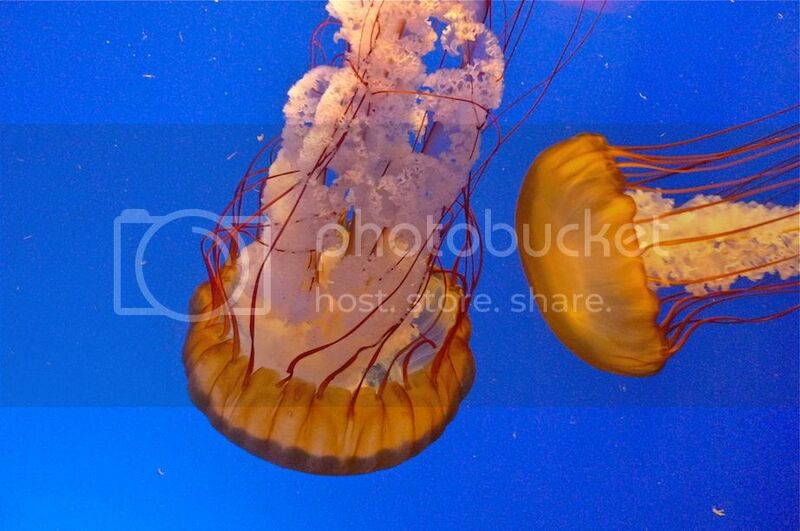 And there were thousands of them swimming away in water tanks and aquariums! 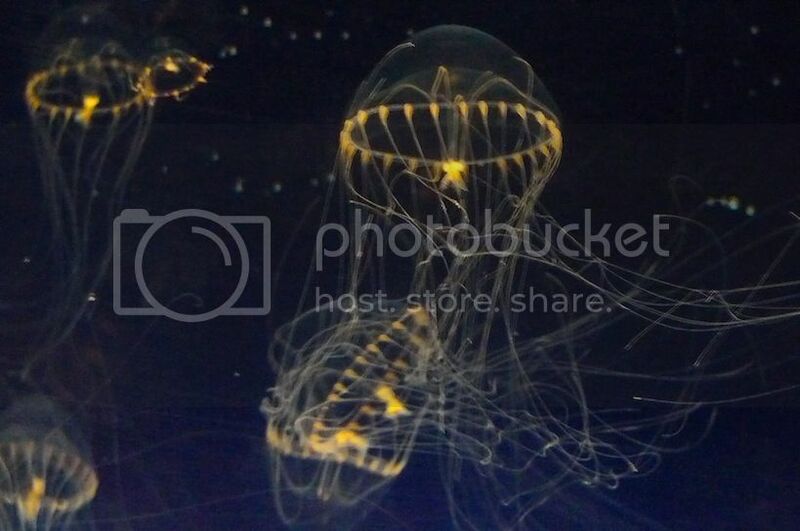 I took a photo of these two jellyfishes that stuck themselves onto the glass! These two looks somewhat magical. 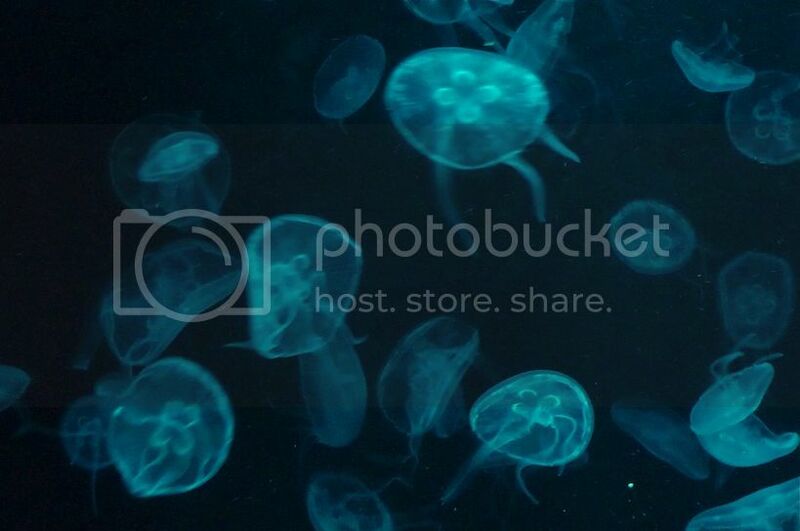 Did these jellyfishes emit their own lights? It was quite astonishing really. 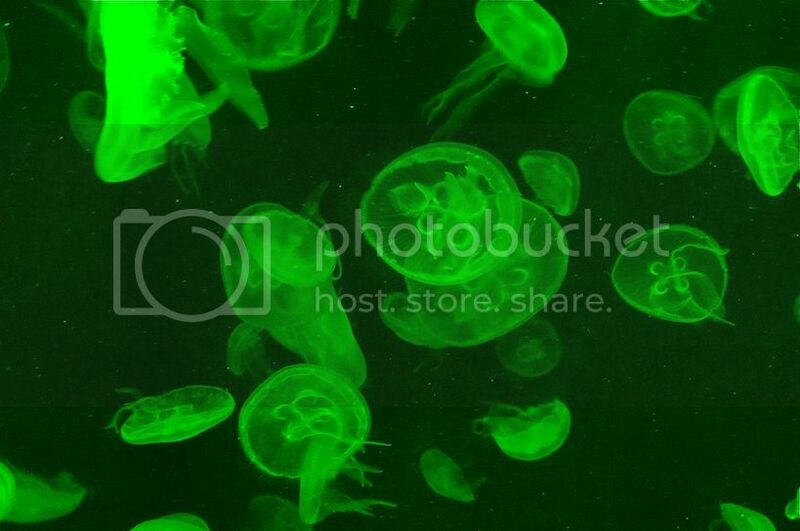 Fluorescent sea jellies? 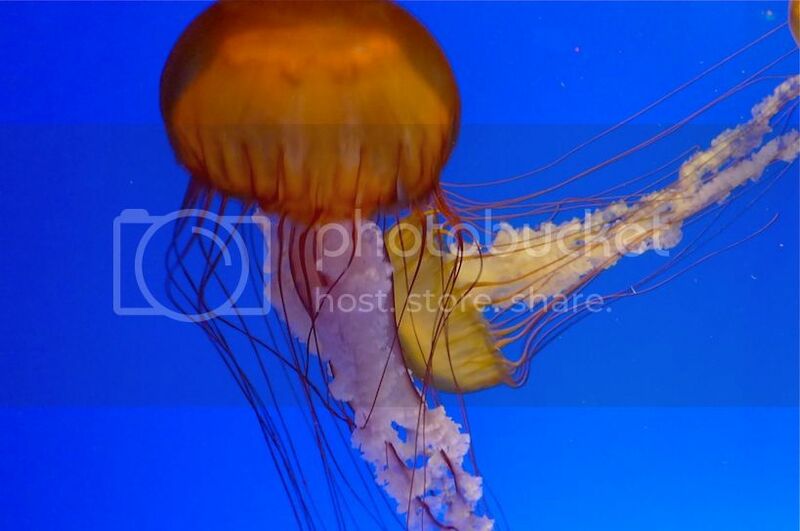 Hundreds of them floating serenely inside the water. 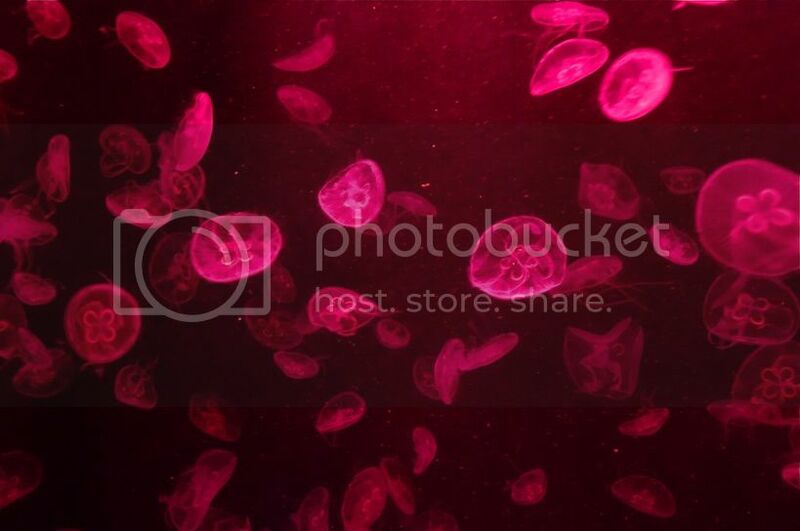 The sea jellies then turned red. Of course, they did not magically change colour. It was the special lighting technology that made them appeared as if they were changing to a different colour every few seconds. In any case, they were fascinating to look at! 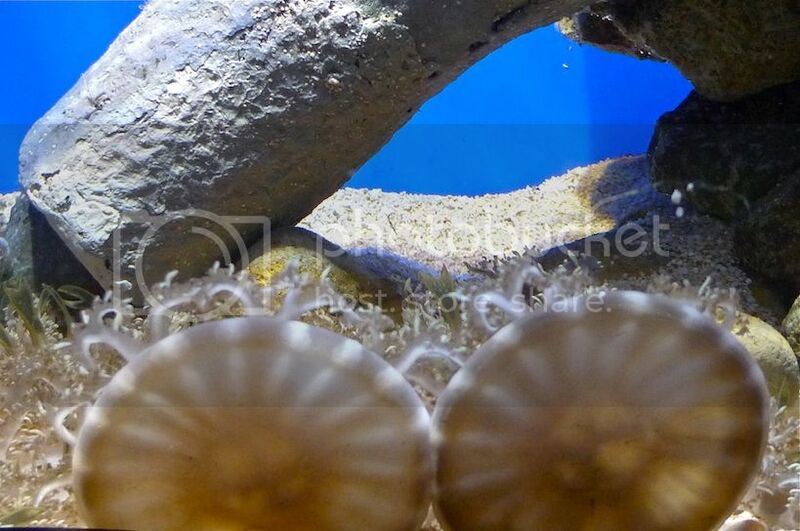 There is also a mirror maze that reflects the jellyfish inside this enclosure which makes it a rather fun experience! 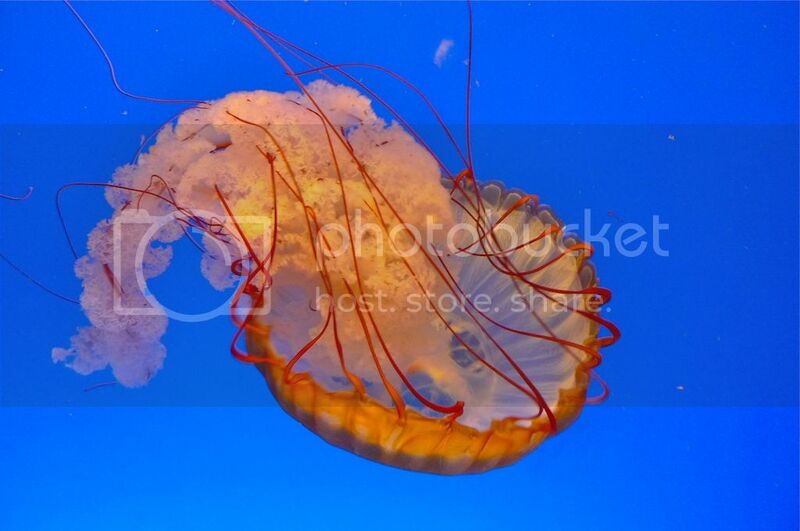 But my favourite sea jellies got to be this one! 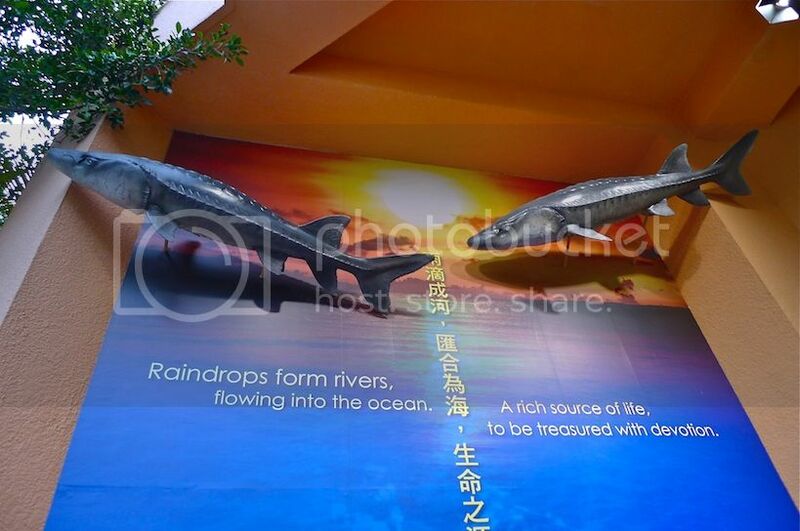 After leaving the Sea Jelly Spectacular, we went over to the Chinese Sturgeon Aquarium nearby to explore the history and culture of Yangtze River in China. There seems to be some sort of a historical timeline that makes interesting reading but I did not bother to take photos of them all. 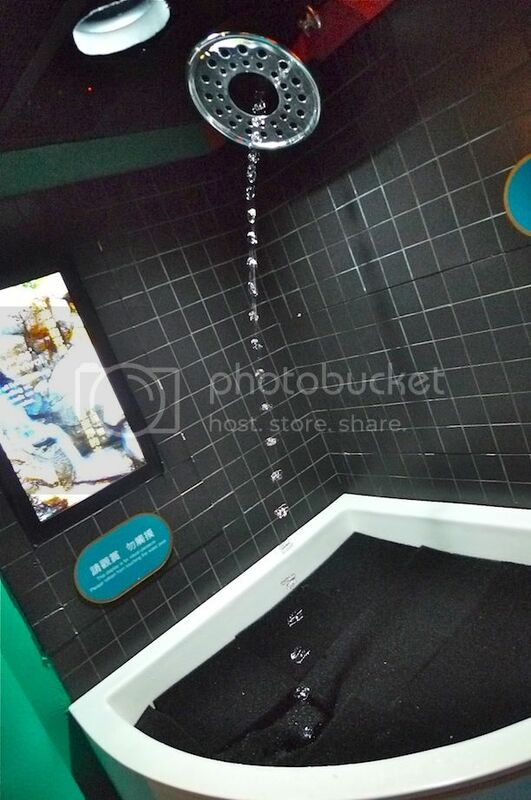 Inside the Chinese Sturgeon Aquarium, I saw strings of water falling down from the top into the drain below. I thought they looked beautiful, although I do not know what exactly they are for. 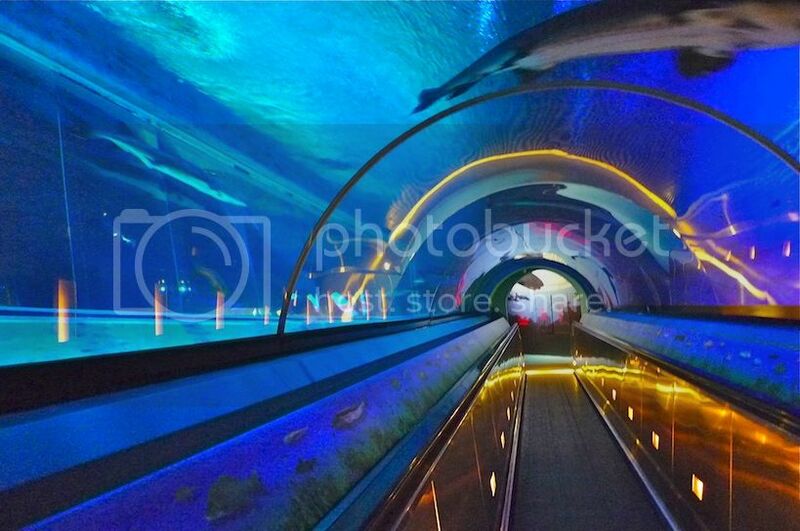 We then entered a tunnel with fishes swimming all around and above us! Among them was the endangered Chinese sturgeon! 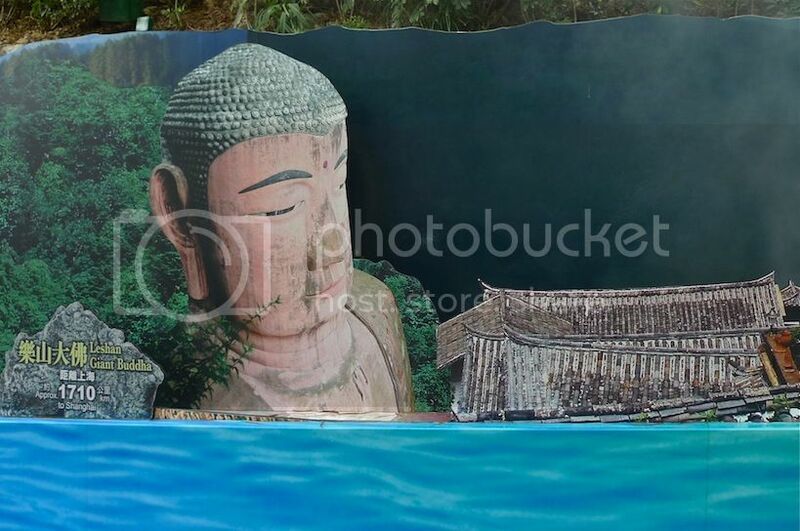 Coming out from the tunnel, we saw something peculiar. 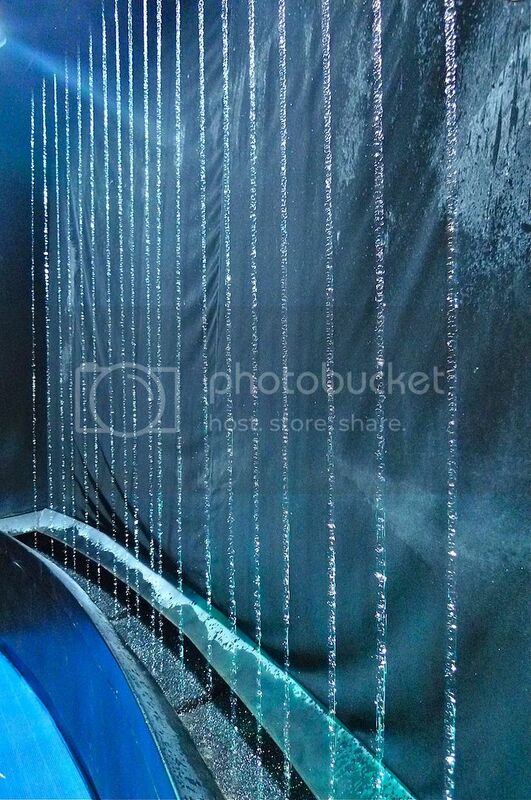 The water droplets seemed to be moving in the reverse from the water pool at the bottom up to the shower above! But of course, it was an optical illusion. I just do not know how they did it. 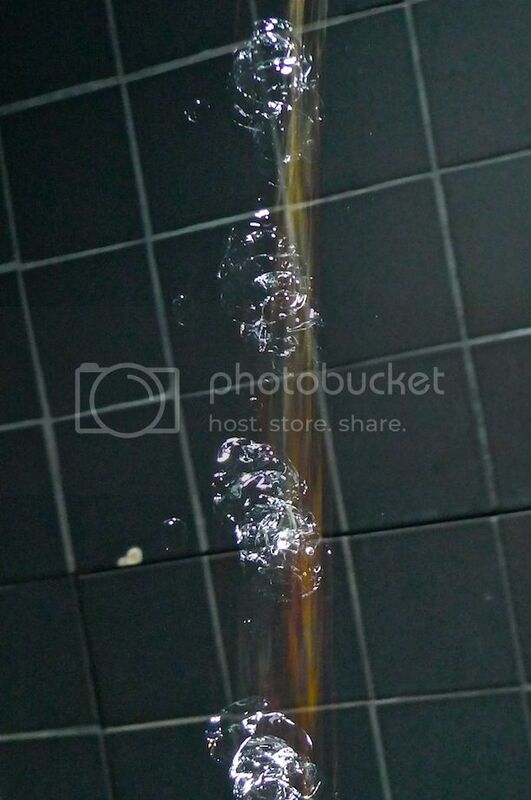 The water droplets seemed magical to me! 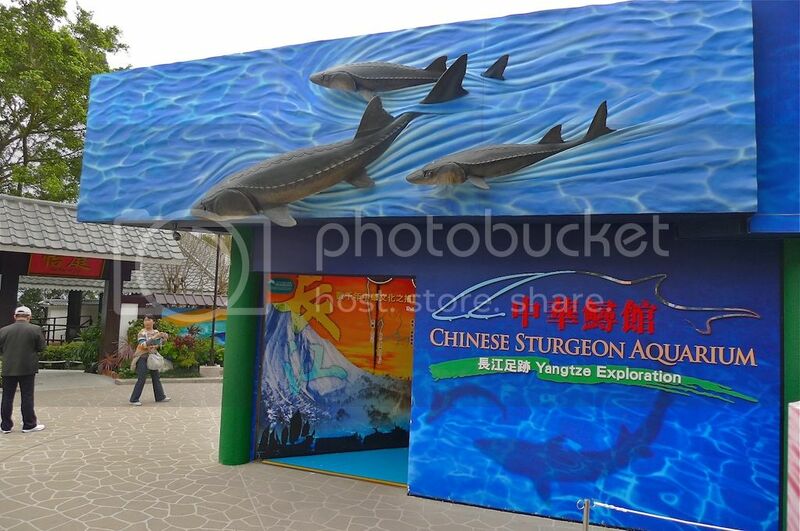 This Chinese Sturgeon Aquarium was pretty interesting and educational! There were many rides for adults at The Summit. 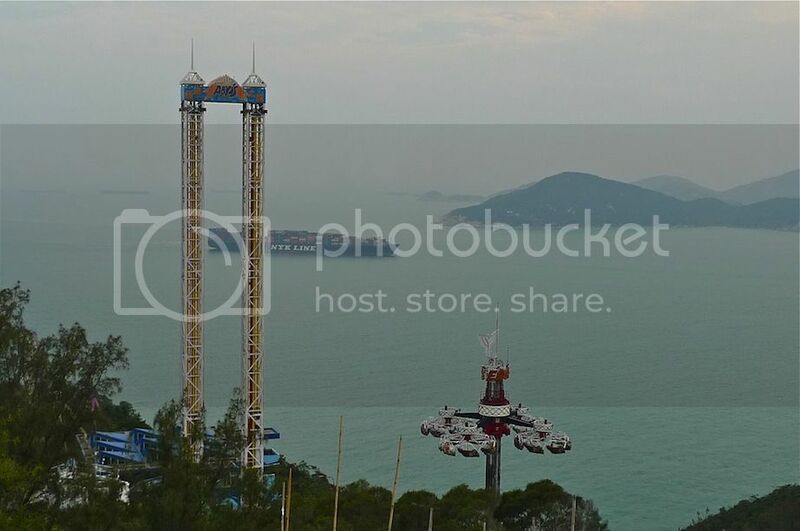 If you are keen on all those thrilling, heart-stopping and adrenaline pumping rides, you will have a great time here! Besides The Abyss and The Eagle mentioned earlier, there are The Dragon roller coaster and Crazy Galleon at Marine World, Mine Train and Space Wheel at Adventure Land, Hair Raiser and Bungee Trampoline at Thrill Mountain, and The Rapids at Rainforest! And that's just naming a few of them! Check out all the rides HERE. We did not sit any of the rides. Simply because we were too lazy to queue up. And besides, we were hungry. Yes, the only food we ate that whole day was the yummy breakfast at the Australia Dairy Company in Jordan before we arrived at Ocean Park! 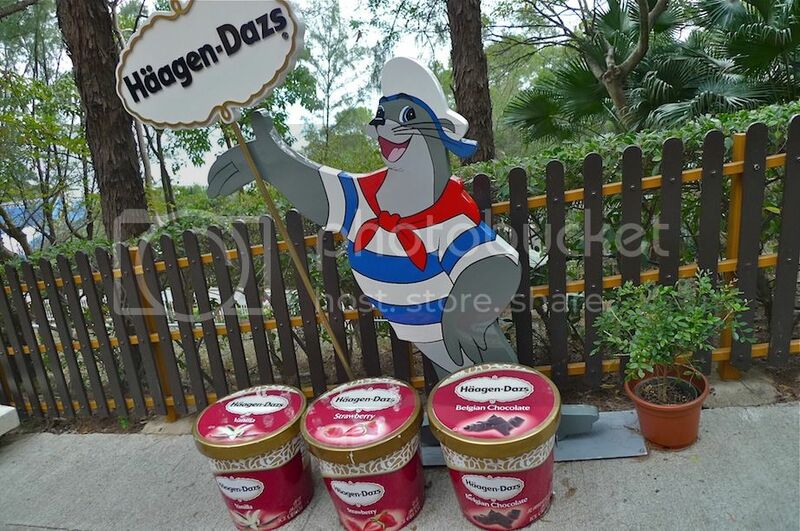 As we walked past this Haagen-Dazs sign, I almost wanted to open up the 3 huge tubs of Haagen-Dazs ice cream! But these 3 tubs were actually seats! Yes, seats painted to look like Haagen-Dazs ice cream tubs! It was already 6pm in the evening. My friend and I decided to go back down to The Waterfront for dinner before the much talked-about water screen show at The Lagoon in Aqua City start. Yes, it's the world's first 360 degrees water screen show called Symbio which was scheduled at 8pm and we would not want to miss that for the world! So we headed towards the Ocean Express Summit Station to take the train down. Along the way, I snapped a picture of this. 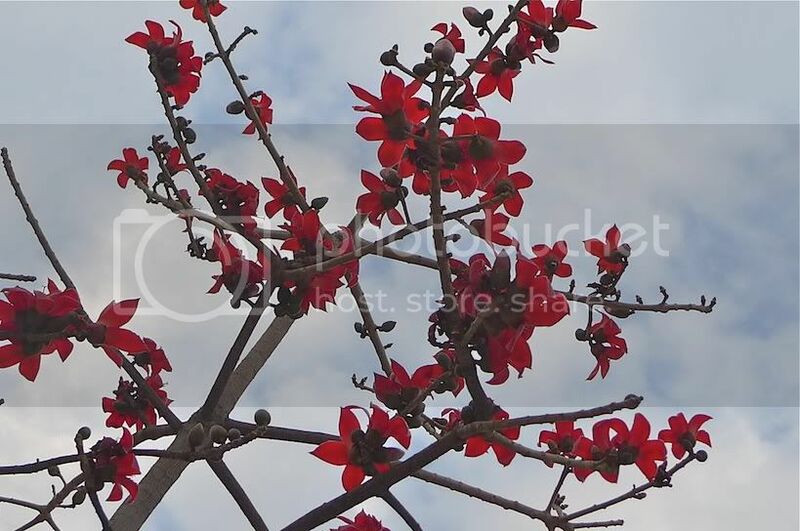 Do you know what flowers are those? I really love the scenery from up here. It was awesome. 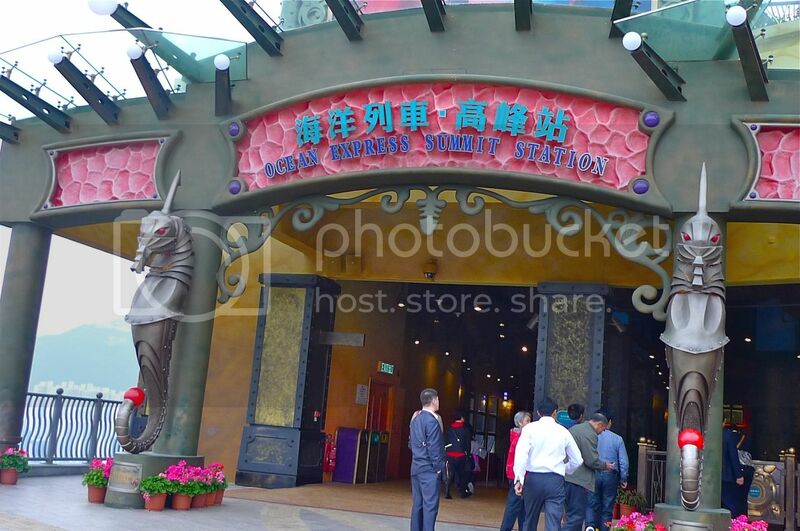 Soon, we reached the Ocean Express Summit Station, with the two giant seahorses guarding the entrance.